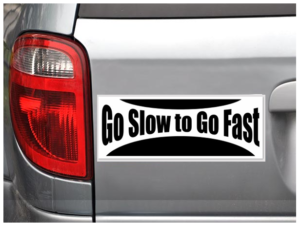 For Greater Alignment, Go Slow to Go Fast - The Jackie Sherman Group, Inc.
Of course Jane wanted to spend as much time as possible on developing strategies – the reason for their meeting. I knew that if they moved too quickly into the strategy conversation, they would get stuck. If they could first achieve enough shared understanding, the development of strategies would be easier and faster. Developing an action plan would then easily follow from that. After introductions and a confirmation of the desire to obtain joint funding, Jane demonstrated what it means to go slow to go fast. She devoted time to establishing a clear understanding of each other’s experiences, their shared situation, and the problem they needed to solve. From there, developing strategies went very smoothly. That approach achieved their goals within the meeting timeframe and positioned them for long-term productivity. The deliberate conversation early in the meeting supported a shared commitment, a clear set of strategies and related action plan, which they have been working since they met. Are you moving too quickly? Jane and I worked to set her meeting up to be effective from the start. How do you know if you even have a problem of going too fast? As a leader, it’s important to recognize when slowing down will ultimately allow you to achieve results more quickly. The following advice especially will benefit any leader who is under pressure to deliver greater value in less time. Decisions and discussions often get revisited. Something had been decided, only to have it brought up again; the same discussion over and over means the work did not get done effectively the first time – time is wasted. Meetings are rushed or incomplete. An overstuffed agenda results in the group not finishing all the items or rushing through important ones, which can result in revisiting those discussions. When we try to pack too much into the time we have, we often skip steps or don’t fully complete the individual steps we’ve started. What happens? We need to back-up, or start over and have the conversations again. You will increase your organization’s effectiveness when you increase your understanding of how much time is needed for effective communication. Most of us underestimate the time it will take for a group to complete a conversation, finish a task, or make a decision that will stick. When you go too fast, you end up redoing the conversation, the decision, the entire meeting. An effective leader knows that the decision to go slow to go fast is tied to an understanding of alignment, defined as the coordinated movement of two or more people. Without it, a group’s ability to solve a problem or execute a decision will take more time. When delivering value depends on people being aligned to solve a problem or execute a decision, you need to go slow enough to achieve alignment. People are aligned when they agree on what they need to do and how to get it done. The strength of agreement can vary. If the agreement is not strong enough then the decision doesn’t hold. If a team’s decisions and discussions often get revisited, their decision process is resulting in thin agreement. Thin agreement results from moving too quickly through the discussion and decision process. Not everyone was heard, all the issues weren’t examined, or differences in perspectives did not get adequately resolved before moving to decide. What does this look like? The meeting agenda item is to make a decision about XYZ. You ask what the issues and options are, and once articulated, you move quickly to “call the question” and bring the group to a decision about XYZ. You identify the option preferred by the group and you check quickly for agreement – people nod or say yes. You have your decision about XYZ and move to the next agenda item. The decision does not hold. XYZ pops back up in future discussions and meetings, and you have to spend time revisiting the issue. It’s like “rework” in a manufacturing process. The decision has a quality defect, so it needs to go back through the line. Time is wasted and productivity sacrificed. How do you keep this from happening? Here are actions that help achieve thick agreement. Allow enough time for full discussion of an issue, including pros and cons and potential implications. Aim for deep understanding among team members by fully checking for differences, and testing agreement at each step along the way. Take the time to combine the best aspects of several options into one that better meets the needs than any of the original options. Be aware of people expressing agreement based on what they think they’re supposed to say, which leads to thin agreement. Improving productivity is a constant demand across all fields, and conventional thinking is that productivity improves by working quicker. Depending on the nature of your work, you may benefit from challenging that conventional thinking. When your organization’s productivity depends on the alignment of a number of people, you will benefit by choosing to go slow to go fast. Going slow will help you create “thick agreement” among team members, them to move to the next step as quickly as possible. It may take more time up front to get to a decision that is supported, but when you’re ready to implement, everyone’s on board. Please let me know your thoughts and related experiences as we share insights to build effective leadership.